. Your cart will total 21 points that will be converted into a voucher of $21 towards your next purchase! Must be logged in to collect points. 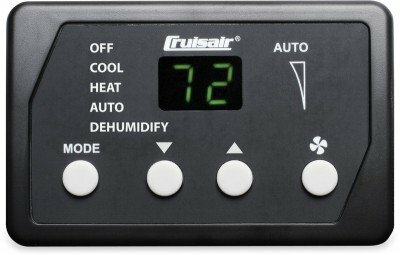 The Q-Logic microprocessor control system works with Cruisair direct expansion evaporators and tempered water air handlers. 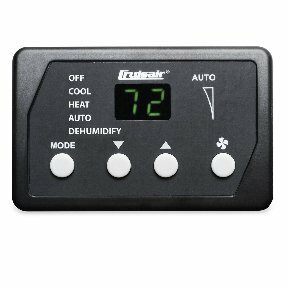 Q-Logic consists of a power/logic circuit board installed in the electrical box of the evaporator or air handler. The Q3 display is rectangular with a bezel look and LED display window. Designed as an economical version of the Qht, the Q3 features a sturdy, smooth, black plastic case with attractive white lettering, and raised buttons for easy access. Like the Qht, the Q3 was developed for user-friendly, logical operation. Both displays have three levels of brightness and a programmable sleep mode in which the display dims automatically when not in use. An optional CAN-bus network adapter is available for new Q-Logic systems and as a retrofit for existing installations to provide ship-wide network monitoring and controlling of multiple DX systems or air handlers. A dehumidification mode operates the system on a timed basis so the boat stays ventilated and dry even when no one is aboard (optional electric heat package recommended).